The Six Griffons Lodge, an exclusive club for gentlemen-warriors, is experiencing strange noises and curious apparitions. The manor's small staff is at wits' end chasing phantoms. Tomorrow at noon, the lodge is hosting an elegant luncheon, and the hauntings must be stopped before that exclusive event-or before someone gets seriously hurt. "The Six Griffons Haunt" is an investigative adventure for the Pathfinder Roleplaying Game that can be set in any large city. Presented for PCs of 3rd or 4th level, this 32-page adventure also includes notes and statistics for scaling challenges to PCs of higher or lower level. The adventure contains a new monster, several player handouts, and a file containing a full-scale color map of the lodge ready for printing. 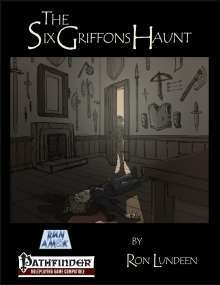 "The Six Griffons Haunt" is written by Ron Lundeen and illustrated by Jeremy Thompson, with maps by Hugo Solis. This title was added to our catalog on November 02, 2011.